Guadeloupe – sometimes known as the Butterfly Island on account of the shape of two of its major islands, Basse Terre and Grande Terre – is a group of islands in the eastern Caribbean, and is a French overseas department. It’s located southeast of Puerto Rico. As part of France, Guadeloupe is now part of the European Union (EU). The island of Basse Terre has green and lush vegetation; it’s also mountainous, with a volcano. Grande Terre is a flat and dry island with a lot of beaches, some of them very touristic. Marie Galante is the biggest island off of mainland Guadeloupe. The islands of les Saintes are comprised of Terre de Haut and Terre de Bas, two of the most beautiful bays. La Désirade is a dry and cliffy island. The island of la Petite Terre is largely wild and uninhabited. Saint Martin island is the French part of Guadeloupe, adjacent to Sint Maarten, the Dutch part. Saint Barthélemy is the jet setters’ island. Not to be missed during your stay is the plate Colombo, which consists of curried chicken and rice, an influence imported from India. You can buy French perfume, wines, lingerie and local handicraft. Fashion boutiques are on Frébault, de Nozières and Schoelcher Streets. Some stores offer a discount to customers who pay by traveller's cheques or credit card. Even though Guadeloupe is part of France, it has its own sports teams. Everyday temperatures in Guadeloupe vary around an average of 27°C, with a maximum of 32°C and only rarely descend lower than 20°C. Once in a while, in the months of December and January, however, temperatures can fall below 20°C at night – an occasion so rare that it makes the news every time! Eastern “trade winds” contribute to the moderation of the region’s tropical heat. Water temperatures vary between 20 and 24°C on the more turbulent Atlantic coast, and around 25°C on the much calmer Caribbean front. Pointe-à-Pitre is the largest city of Guadeloupe, being the seat of the Arrondissement of Pointe-à-Pitre. The history of Pointe-à-Pitre is marked by many disasters: the fires of 1850, 1871, and 1931, the earthquakes of 1851 and 1897, and the hurricanes of 1865 and 1928. Grand-Bourg is a commune on the island of Marie-Galante, in the French overseas region and department of Guadeloupe, itself in the Lesser Antilles. It is located in the southwest of Marie-Galante, and is the most populous of the three communes on the island. Port-Louis is a commune in the department of Guadeloupe, on the northwest of Grande-Terre. Formerly a small fishing village, Port Louis is now a town whose industry and agriculture have developed over the years. 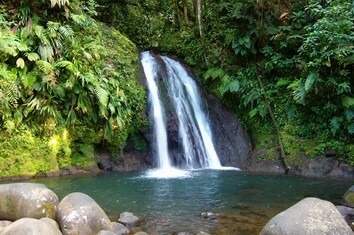 This is the first breeding region in Guadeloupe. Basse-Terre Island is the name of the western-half of Guadeloupe proper, in the Lesser Antilles. It is separated from the other half of Guadeloupe proper, Grande-Terre, by a narrow sea channel called the Rivière Salée. he village is noted for its coffee and banana plantations & stately homes. After following a picturesque trail through desert vegetation, the visitor will arrive at Trou à Diable, a large karstic cave containing an underground lake. The main room of the cave is 900m/2,952 long and sightseers must be guided and wear breathing masks because of toxic mushroom growths on the walls. Guadeloupe National Park is a national park in Guadeloupe, an overseas department of France located in the Leeward Islands of the eastern Caribbean region. The Grand Cul-de-Sac Marin Nature Reserve is a marine protected area adjacent to the park and administered in conjunction with it. The most highly populated city on the island of Terre-de-Haut still retains a small-town feel, with small, whitewashed and red-roofed houses overlooking the sea. Located 9km from Guadeloupe, Les Saintes / Iles des Saintest consists of two main islands, Terre-de-Haut and Terre-de-Bas, and seven smaller ones. Christopher Columbus named it Los Santos in 1493 in honor of All Saints' Day. Visitors will find a simple, pristine way of life. Marie-Galante is an island of the Caribbean Sea located in the Guadeloupean archipelago. There are many things to do from water sports to hiking or discover the Island in an ox drawn wagon. Don't forget the museums as well as Marie-Galante's astonishing countryside and beautiful points-of-view.